We have many take-off sites in the vicinity of the Levi ski resort. Many of our flights begin near the village of Sirka. The flights are arranged according to weather conditions. The flight itself takes about 1 hour. The entire trip takes about 4.5 hours. We arrange a baptism ceremony with champagne and all participants receive a diploma according to ballooning traditions. The land crew transports the passengers and the equipment back to the take-off site. 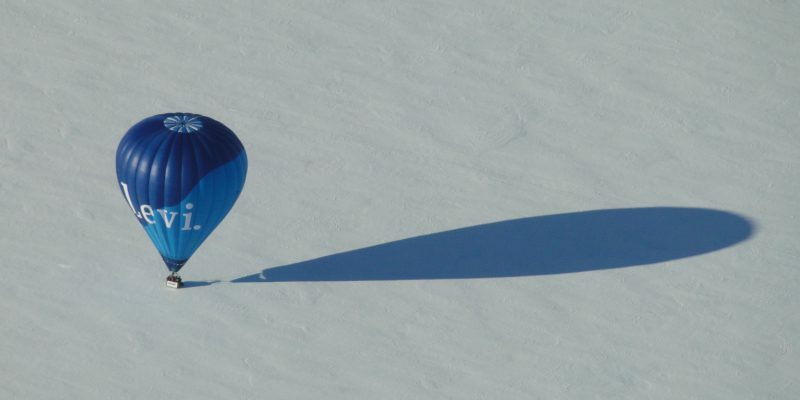 The land crew has a snowmobile at their disposal, with which the balloon can be retrieved from even the most difficult terrains. They are also equipped with snowshoes if the landing takes place in a snow drift. It is possible to combine other services at Levi with the flight. For example it is possible to enjoy a traditional savusauna bath (smoke-sauna) after the flight. Please ask for more information about different services! The price of a flight is 235 Euros (incl.8% VAT) per person. The price includes a 1 hour flight, champagne baptism ceremony and diploma. For more information about reservations, payments, timetables and gift vouchers please call +358 (0)40 583 4652.